Acer has announced the launch of new Marvel Studios’ “Avengers: Infinity War” special notebooks. 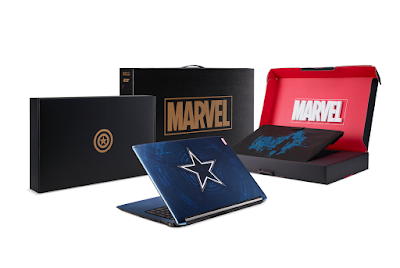 Done in collaboration with Marvel Studios, the Aspire 6 Captain America Edition (PHP 54,999.00 SRP), Nitro 5 Thanos Edition (PHP 69,999.00 SRP), and Swift 3 Iron Man Edition (PHP 69,999.00 SRP) will be available in April until supplies last. Within a premium aluminum cover featuring with Captain America’s iconic pentagram, the Aspire 6 – Marvel Studios’ “Avengers: Infinity War” Captain America Edition is powered by an 8th Gen Intel® Core™ i5-8250U processor and NVIDIA® GeForce® MX150 graphics. The special edition Aspire 6 comes with 4 GB of DDR4 memory (user-upgradeable to 16GB) and 1 TB of SATA HDD storage, and also packs a HD camera with HDR while Dolby® Audio™ Premium provides a great entertainment experience. Speedy network connectivity is provided with 2x2 MIMO 802.11ac wireless technology and Gigabit Ethernet. Enhanced multimedia performance is what makes this special edition Aspire 6 stand out from the pack. Its 15.6-inch Full HD display with IPS technology provides consistent colors and viewing from wide angles. Acer TrueHarmony delivers lifelike audio, while two digital microphones with Acer Purified.Voice ensure a great Cortana with Voice experience. For additional peripherals, there is a USB 3.1 Type-C Gen 1 port, USB 3.0 port that supports power-off charging, and another two USB 2.0 ports. 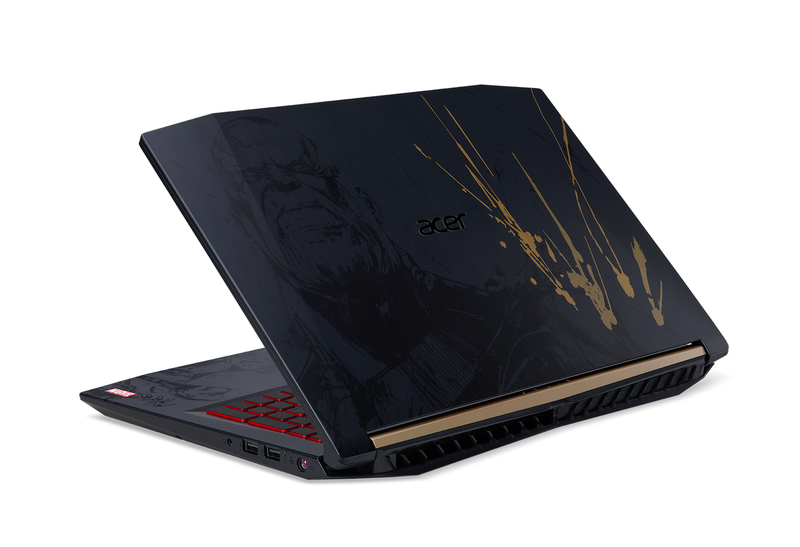 The new Nitro 5 – Marvel Studios’ “Avengers: Infinity War” Thanos Edition’s is part of Acer’s Nitro product line for casual gaming. The notebook’s top cover features a Thanos portrait decorated by IMR (In-Mold Roller) finishing technology, which complements its bold matte black chassis outlines and hairline-brushed finish. The special edition of Nitro 5 is powered by NVIDIA® GeForce® GTX 1050 graphics with 4 GB of GDDR5 VRAM, an 7th Generation Intel® Core™ i5-7300HQ processor and 8 GB of DDR4 memory (user-upgradable to 16GB) . Ideal for accelerating boot-up time and shortening in-game loading times, the special edition Nitro 5 comes equipped with a super-fast 128 GB SSD paired with a 1 TB HDD for storage. A Gigabit Ethernet port delivers fast and reliable wired connections, while 802.11ac 2x2 MU-MIMO wireless technology provides blazing-fast wireless connectivity. A comprehensive selection of ports includes one USB 3.1 Type-C (Gen 1) port, one USB 3.0 port with power-off charging, two USB 2.0 ports, and an HDMI 2.0 port1, which can support up to 90 Hz refresh rates. The Nitro 5 – Marvel Studios’ “Avengers: Infinity War” Thanos Edition has a 15.6-inch Full HD (1920 x 1080) IPS display, while Dolby Audio™ Premium and Acer TrueHarmony™ technology provides incredible sound depth. These work in tandem to provide immersive experiences for gaming or watching movies. Of course, no gaming system is complete without a thermal solution to manage heat and keep the system running optimally. The Nitro 5 features dual fans with Acer Coolboost™ technology, which deliver heightened fan speeds and cooling ability, and allow users to manually control the cooling process when heavy use requires an added boost. 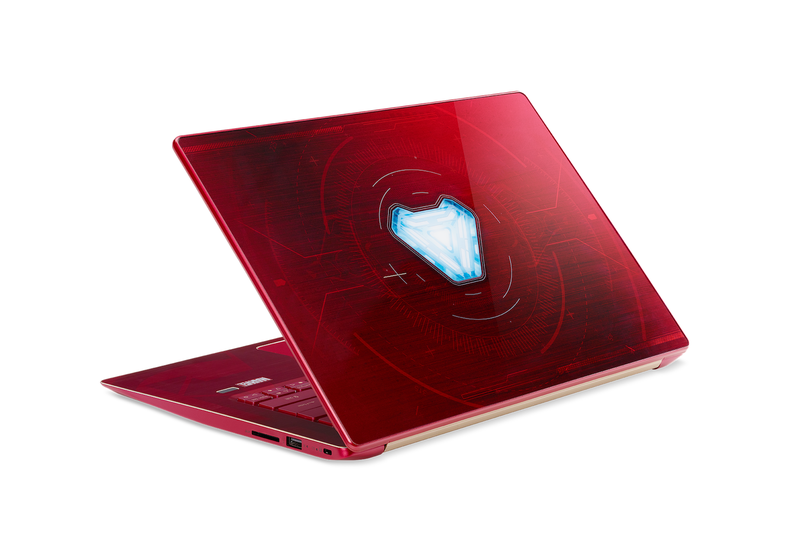 Measuring in at 17.95 mm in height and weighing 1.6 kg, the Swift 3 - Marvel Studios’ “Avengers: Infinity War” Iron Man Edition’s svelte and lightweight design features a sturdy aluminium top cover decorated with Iron Man’s glowing Arc Reactor. It features an 8th Generation Intel® Core™ i5-8250U processor, Intel® UHD Graphics 620, and offers up to 10 hours of battery life to help users power through a full day of work and beyond. In addition to its battery life, Swift 3 sports a collection of other indispensable features for achieving maximum productivity, including a vivid 14-inch Full HD IPS anti-glare display, a fast 256 GB SSD, 8 GB of memory and 802.11ac 2x2 MU-MIMO wireless technology for fast and reliable internet connectivity. It has a USB 3.1 Type-C port and an HD webcam with Super High Dynamic Range. Lastly, the backlit keyboard makes typing in dimly lit environment effortless and a spacious Precision Touchpad provides ample room for navigating, scrolling and zooming. For more information, visit the Acer Philippines Facebook Page at www.facebook.com/AcerPH and the Acer Philippines website at www.acer.com.ph, and follow @acerphils on Twitter.